GE is a great example of a traditional company that has recognized the need to transform into a digital organization, but by all measures 2017 has been a tough year for the industrial giant financially. The company stock price has tumbled, and last week it announced that it was laying off 12,000 employees in its power business worldwide. While you can’t attribute all of the company’s woes strictly to its digital transformation efforts — it probably would have happened anyway — it still has to be discouraging to other companies undergoing a similar journey. Yet for all its difficulties in 2017, GE remains a case study of an enormous company moving a worldwide operation with over 300,000 employees into the digital future. Regardless of this year’s financial results, you can’t take that away from them. GE was one of the first big enterprise companies to fully embrace the cloud, announcing its intent to close most of its on-premises data centers in 2014 when many companies were still coming to grips with the cloud conceptually. It’s a big AWS public cloud customer, and it has embraced SaaS with a huge contract with Box back in 2014 and Vera this year, just as a couple of examples of how it has been moving the entire company to the cloud. It also recognized the shift from simply selling large industrial machines like wind turbines, airplane engines and MRI machines to the industrial Internet of Things. By equipping these machines with sensors, they can follow a digital trail of data to understand the health of those machines. The company has built out the Predix platform to take advantage of this growing move toward data and to allow its customers to build applications to understand and take advantage of all the data its mega machines are feeding them. Former GE CEO Jeff Immelt. Photo: Pool/Getty Images. As former CEO Jeff Immelt put it back in 2014, “If you went to bed last night as an industrial company, you’re going to wake up a software and analytics company.” He truly seemed to get it. His company was building out tools and technologies to take advantage of this changing market dynamic, but the fact is that just because you get it doesn’t mean you are guaranteed immediate success. And while GE clearly is a company in the midst of transforming, it’s finding that there are growing pains along the path to change. This year certainly has illustrated that. Immelt left the company earlier this year, three months ahead of his scheduled departure and his replacement John Flannery did not exactly like what he saw after he took over and began examining things. Quartz reported earlier this year about an atmosphere of executive excess with bloated salaries and crazy perks. In an Economist article last month, the venerable publication described a listing company, one that, while innovative, lacked the requisite business discipline. Their most recent earnings report in October had a big earnings miss and the stock had lost 23 percent of its value this year. The previously referenced Economist article pointed out that GE is the worst performing stock on the Dow Jones Industrial Average this year. That’s not the end result you hope to see when you undergo a digital transformation. On top of all this, an activist investor, Trian, has been putting additional pressure on the company to exercise more financial discipline, and with these numbers it’s hard to blame them. Yet for all its issues, GE is very much a case study in digital transformation, just by virtue of the scale of the change it has been undergoing for the last several years. Just because it has hit a speed bump, doesn’t mean that stops. It will be up to Flannery to figure out how to right the ship, but the digital transformation continues. Last spring, I spent a day at the GE Global Research Center in Niskayuna, New York where I saw a company that was pushing as hard as it could toward the future. The campus was a monument to digital transformation, a laboratory of digital experiments that included robotics, the blockchain and augmented and virtual reality. I spoke to people who were trying to build the next generation of tools at GE and push those tools to the business units around the world. But for all that The Economist sees a rough road continuing for the industrial giant in 2018. 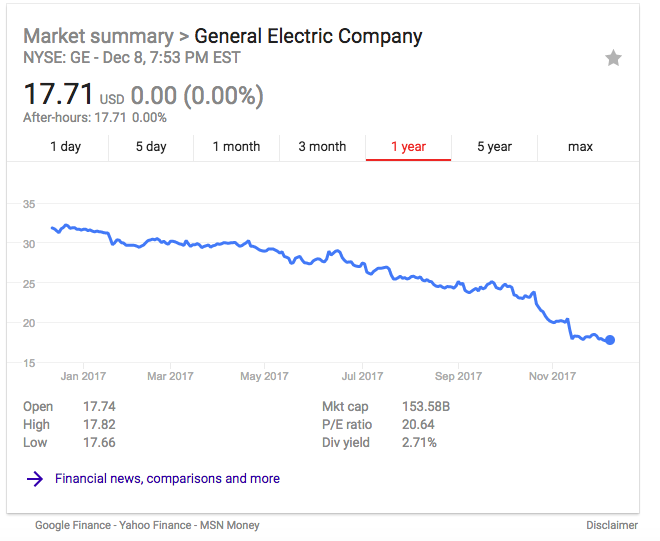 That doesn’t mean that old guard companies like GE should just throw up their hands and give up. They have little choice, but to keep looking for ways to push that transformative culture deeper and deeper into the organization, and over time, that should provide a foundation for substantive change that translates into more concrete financial results. While it’s clearly not easy, doing nothing is not an option.